Flawless skin is one of those goals almost everyone can relate to and work towards, but the more short-term ambition to cure a pimple overnight is slightly trickier. 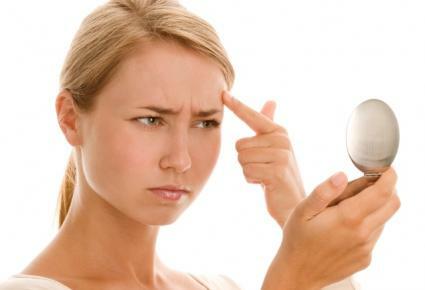 Certain products and remedies, however, may help to reduce the redness and swelling of a pimple quickly. Aspirin has become something of a wonder drug for acne sufferers, and its heightened popularity as a blemish treatment has garnered it a major following for reasons other than pain relief. Because it is an astringent, aspirin works quickly to get rid of pimples. Place a few drops of warm water on top of four uncoated aspirins; they will begin to dissolve. Help them along by breaking them down with your fingers or using a spoon if necessary. Apply to your pimple using a cotton swab and leave on overnight. The next morning, rinse the paste off. Finally, follow up with an anti-inflammatory substance like tea tree oil. Apply to a cotton swab and dab it onto your blemish. Any redness will be history in seconds. Even though it's not guaranteed that your pimple will disappear completely, the above method will certainly reduce it significantly in size. It will also promote faster healing. If you find that you need a little concealer to be able to brave the outdoors and the general public, use a clean cosmetic sponge to very gently tap the product onto your blemish. Apply the least amount of product possible, as this is one of those situations when less is definitely more. If you don't have aspirin or have tried the above trick without success, there are a few additional options you can try. Honey is recognized for its antiseptic properties. Make good use of this common kitchen ingredient by dabbing it directly onto the blemish with a cotton swab. Leave it on for an hour or so before going to bed, then rinse. Toothpaste is another astringent remedy that is said to work by drying out the blemish. Look for original formula pastes, not gels or mixed formulas. Apply directly to your pimple and leave it on overnight. Calamine lotion acts quickly to dry out pimples, but it will leave a residue on the skin when it dries. To avoid any embarrassment, dab the lotion on just before bedtime and let it dry completely before going to bed. In the morning, simply remove any traces of the lotion with a mild soap and water. Milk of Magnesia: Dab some on a pimple before going to bed to help calm and relax the skin. Many times, this will have the effect of causing pimples to literally disappear overnight due to the naturally occurring zinc in the Milk of Magnesia. Apple cider vinegar: To use, moisten a cotton ball or cotton swab with the vinegar and apply to the affected area. The pimple should dry up fast once you apply this natural astringent to it. Hydrocortisone cream: According to NYC dermatologist Dr. Francesca Fusco, this can quickly reduce the inflammation of a blemish when applied as a spot treatment. Clearasil Ultra® Rapid Action Vanishing Treatment Cream: Formulated to reduce redness and pimple size, this product (about $11) claims to work in as little as four hours after application. Empowered by benzoyl peroxide (10 percent), it delivers medication to the area while eliminating bacteria. Clear & Clear® Advantage® Acne Spot Treatment: According to Clean & Clear's clinical testing, 100 percent of individuals who used this product (around $6) experienced improvement on the first day of application. It works to instantly reduce surface oils, allowing the medication to penetrate your blemish. Dermalogica® Overnight Clearing Gel: Apply a thin layer of this lightweight, non-greasy gel (about $25) to skin before going to bed to wake up to clearer skin in the morning. The active ingredient is 25 percent salicylic acid, which works fast to cleanse and kill bacteria while reducing excess sebum production. Just Natural Acne Spot Treatment: The manufacturer purports that this all-natural formulation of antifungal, antibacterial ingredients goes to work quickly and cures most pimples overnight. The natural ingredients include powerful acne fighters like tea tree oil, vitamin E, and aloe vera leaf juice, and the product is free of any harmful chemicals or toxic additives. Find it for about $20. Mario Badescu Drying Lotion: According to the website information, you can use this drying lotion (around $17) to shrink whiteheads while you sleep. Just dab on, let the lotion air dry ,and rinse off any residue in the morning. The active ingredient is salicylic acid, and the formula is safe and gentle. Bye Bye Blemish: This overnight drying lotion (under $10) contains ten percent sulfur to help reduce blemishes overnight. This product is also safe for sensitive skin. Happy Me Overnight Pimple Eliminator: Formulated with zinc oxide and tea tree oil, this treatment (around $15) promises to work quickly to reduce redness and pimples. If you aren't able to make much of a difference in your pimple's condition overnight, don't fret. Instead, use this as an opportunity to show off your makeup skills. Concealing pimples is definitely possible with the right products. Remember that not all skin is created equal, and there could be other factors such as hormonal imbalances, dietary deficiencies, or health problems that are causing or exacerbating an acne flare up. A remedy that works overnight for one individual could take more time to work for another, so patience is key.